Look no further than ABC’s Jimmy Kimmel Live to get your nightly dose of anti-conservatism with a side order of vitriol towards President Trump and his administration. The worst part about it is that his audience eats up the liberal propaganda with loud cheers and gut-busting laughter. But what Kimmel just did to Sen. Ted Cruz was gross and unbelievably disrespectful to the Texas senator. Sen. Ted Cruz and Jimmy Kimmel have a longtime feud with each other. 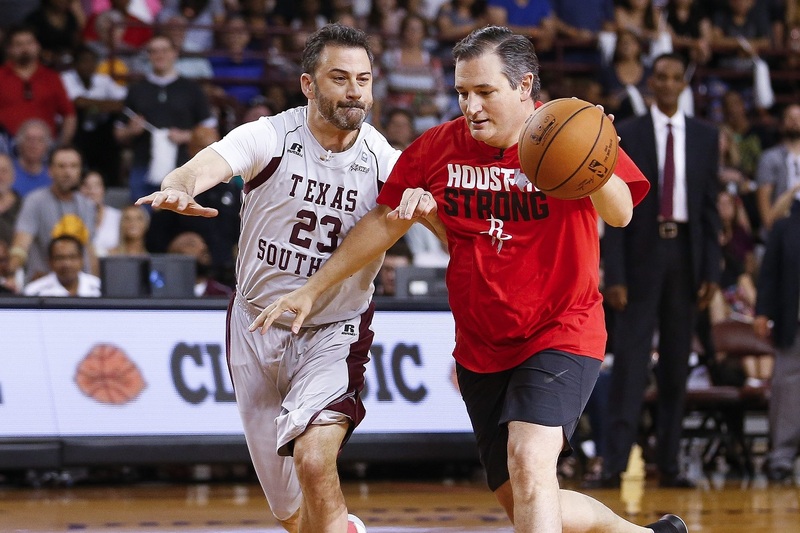 The two actually seemingly buried the hatchet when Cruz challenged Kimmel to a charity basketball game. It was hysterical to watch because neither of them are any good at the sport. It was ugly and sloppy. Nevertheless, it seemed like Kimmel was grateful to the elected official from Texas to take the time out of his busy schedule, but things obviously changed over the coming months because Kimmel proceeded to shamelessly attack Cruz’s appearance and character with a sketch on his show this week. The sketch featured Kimmel staring at a screen that showed “God” in a white golfer’s outfit, played by Billy Crystal, and Satan, in all red with a guitar, played by Foo Fighters frontman Dave Grohl. God and Satan play rock, paper, scissors to see who would get Ted Cruz, but God won and said he would give Cruz to Satan anyway because he didn’t want to see Cruz’s “face” for all of eternity. That’s cruel to attack someone’s looks like that. Cruz recently grew a beard that he sported in Washington and liberal Twitter had a field day with their criticisms of his appearance. He’s probably right that Kimmel’s feelings are hurt otherwise he probably wouldn’t have felt the need to do that sketch in the first place. This is Kimmel’s shtick though. When Trump visited Buenos Aires, Argentina recently for the G20 Summit to meet with world leaders, Kimmel couldn’t help but make fun of him then too. He then showed footage of the president taking considerably longer to sign his name on a trade deal than other leaders. “It’s like he’s coloring it in or something,” he joked. Then they shared footage of Trump awkwardly leaving the stage before a planned photo with the Argentinian president, Mauricio Macri. It’s a puzzle as to why liberals find this sort of content funny. Trump and Cruz are public servants who sacrificed for the good of all of us. Why wouldn’t you treat them with a little more respect? After all, they both won their respective races through the Democratic process, which means they have a right to be there whether people like Kimmel like it or not.